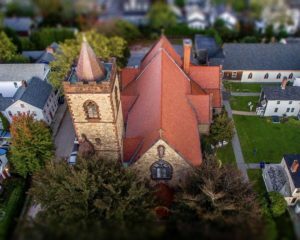 Place : St. John's Church is located at 61 Washington St., Newport, at the corner of Washington and Willow streets. The Guild Hall is diagonally across from the church with a street address of 61 Poplar St. Free parking is available in the church parking lot opposite 25 Willow St.
St. Johns invites all to a brief, festive and incense-free service of Choral Matins (Sung Morning Prayer) followed by a Mother’s Day Community Brunch on Sunday, May 12, at 11:45 a.m. 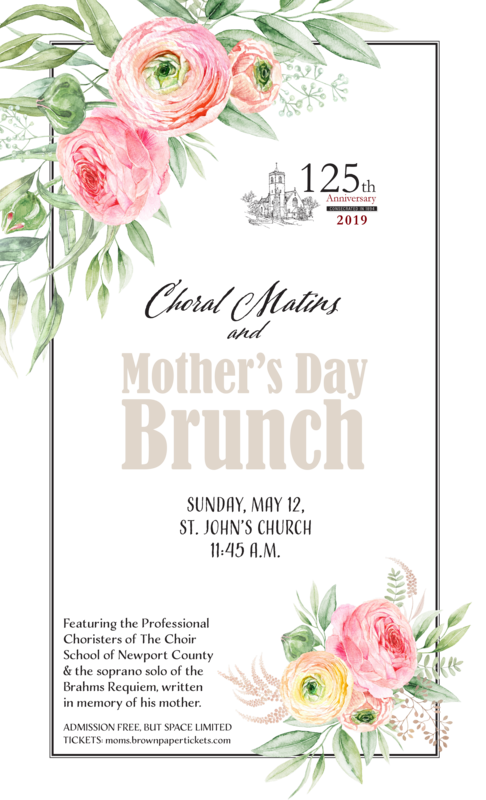 The brief Choral Matins at the church, performed by Professional Choristers from The Choir School of Newport County, and the St. John’s Adult Choir, will be followed by the Mother’s Day Community Brunch in the Guild Hall. The anthem will be the comforting soprano solo movement from the Brahms Requiem, written in memory of his mother. The Te Deum and Jubilate will be the stirring set written by Herbert Howells for the famous chapel of King’s College, Cambridge, and the 1894 Hook & Hastings organ will be featured in a newly transcribed improvisation by Gerre Hancock.